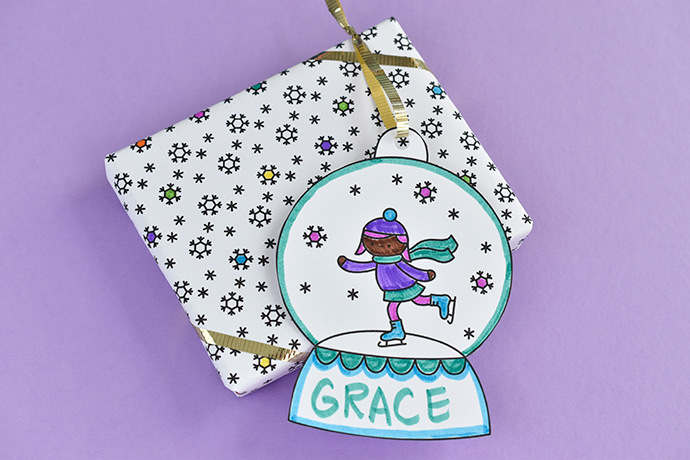 Wrap and tag your gifts this year with printable tags and paper you can color yourself! 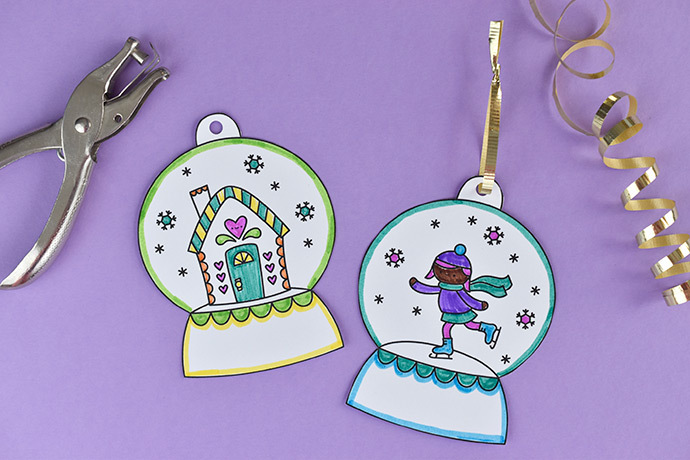 These super cute snow globe tags are a fun way for kids to create part of the wrapping, but they’ll also love seeing them on their presents too. 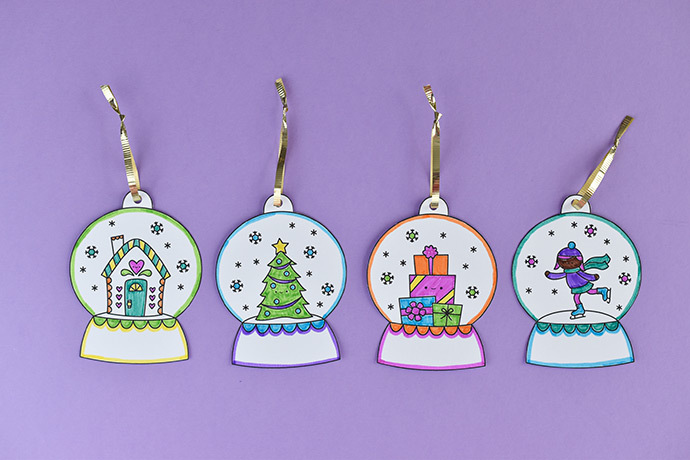 Plus, the snow globes double as printable ornaments! 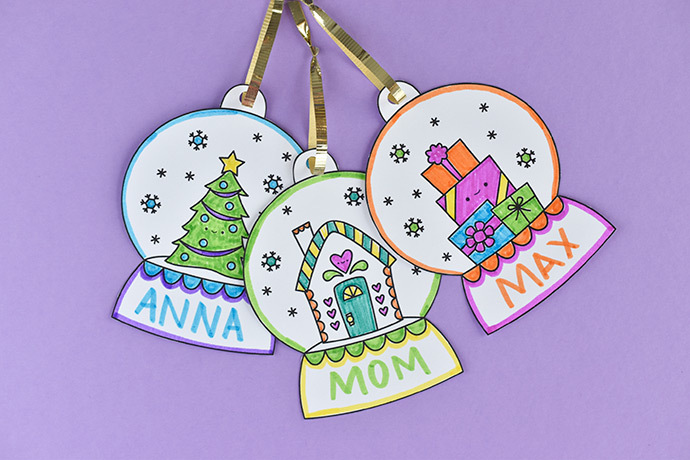 There are so many ways to color these tags, so you can match them to regular wrapping paper, or print some with coordinating snowflakes. The base of each snow globe has lots of room to write a “to” and “from”, or just a name. If you’d rather, you can write a message on the back so the front can be completely colored and looking pretty hanging on the tree. 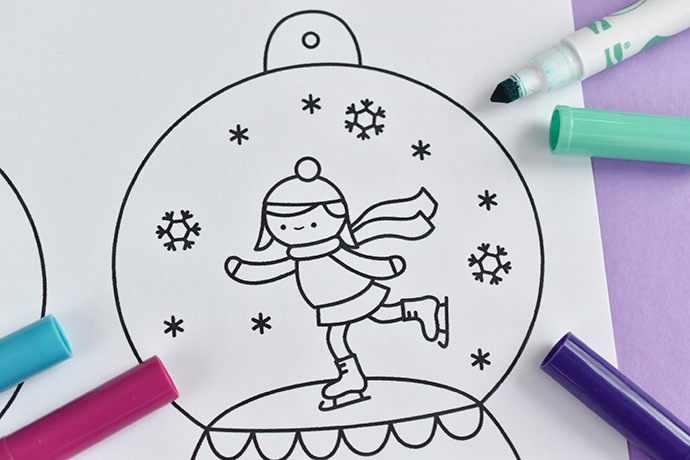 Print out a bunch and get ready for a coloring and wrapping party! 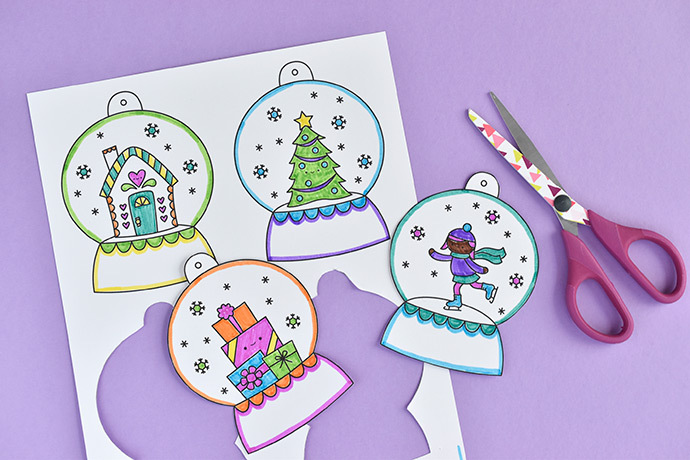 Print the snow globe gift tags on card stock. Color the tags however you like. If you’d like you can add some glitter glue, sequins, or fake snow for extra detail and fun texture. Cut out the gift tags. In the areas that are indented, it helps to cut into the corners from both directions so you don’t bend or tear the tags. 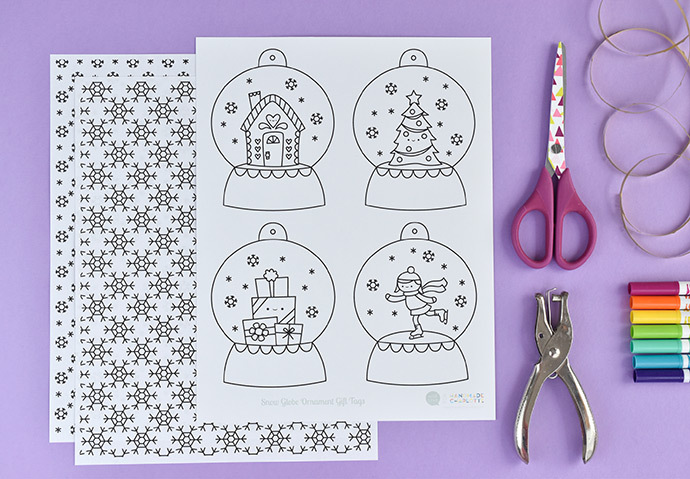 Use a hole punch on the circle at the top of the snow globe. Cut a piece of ribbon for each gift tag and tie them through the gift tags. Making a look this way is good for either a tag or an ornament. If you’d rather, you can use a longer ribbon and tie the tag onto a gift as you tie the ribbon. To make matching gift wrap, print one of the gift wrap pages on regular paper. Color it as you like or leave it in black and white. 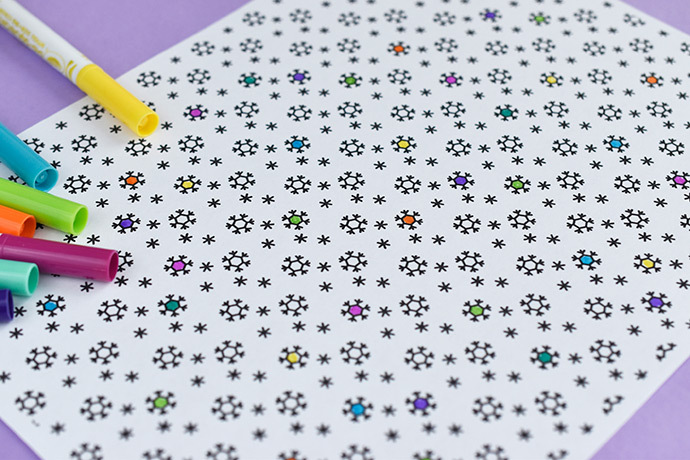 Even though the wrapping has snowflakes on it, don’t be afraid to color them in a rainbow of snow! 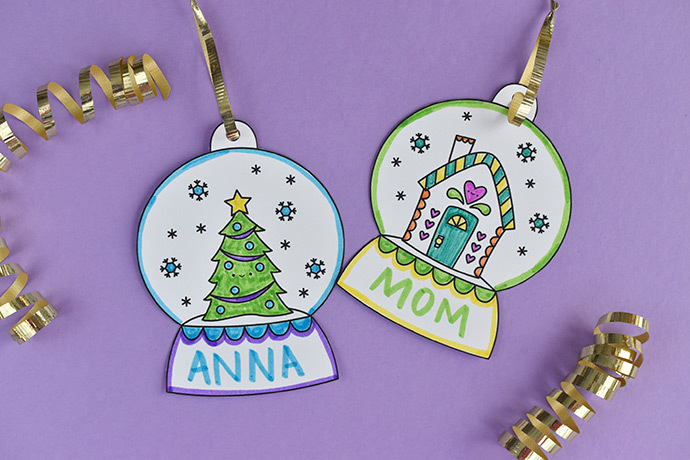 Use your wrapping paper on small gifts and add a snow globe tag with a name added to the base. It’s all ready for gifting! 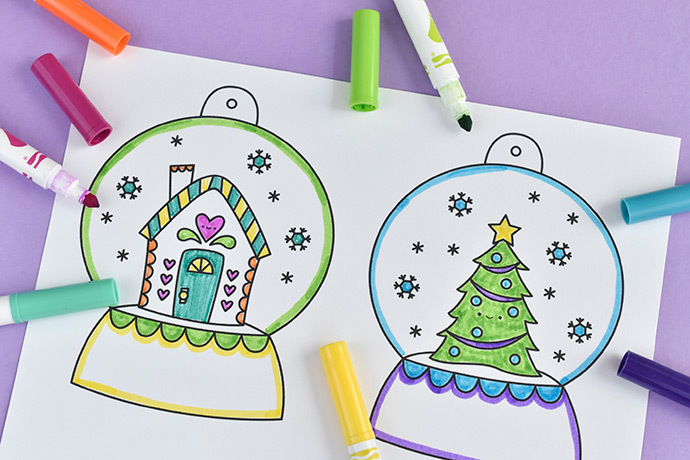 Color a bunch of snow globes so they’ll be ready for wrapping all your gifts. Or, make even more and use them to decorate your Christmas tree! 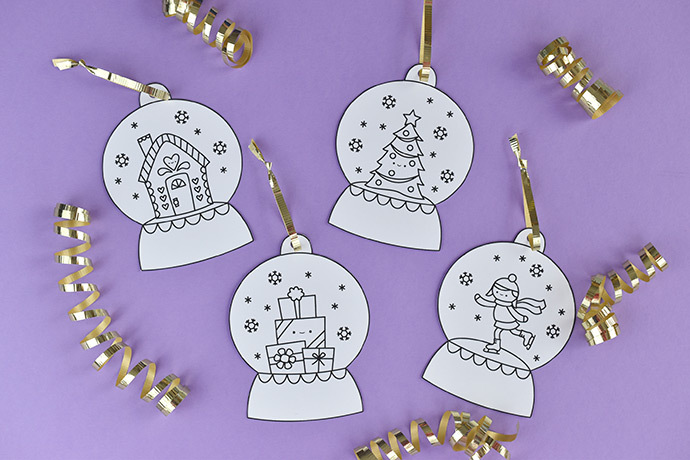 The fun thing about these ornament tags is that you can also use them without coloring. When you leave them in black and white they have a modern look. 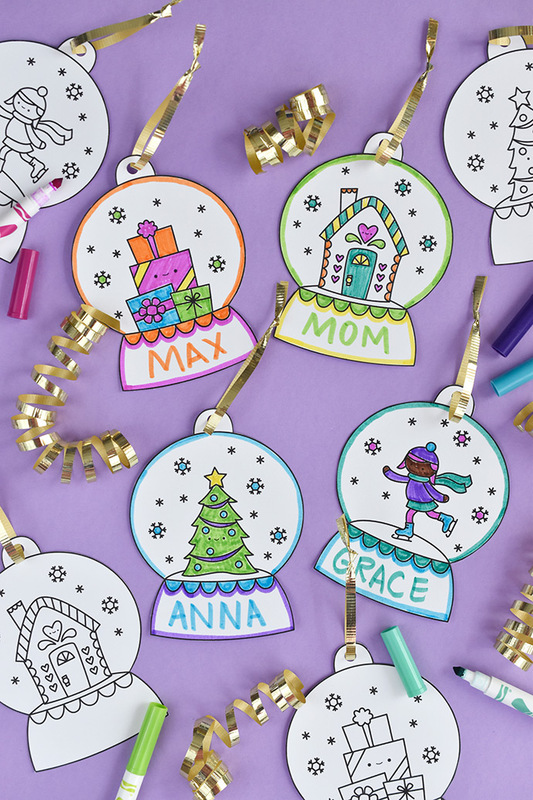 You could also leave them in black and white and then attach a few crayons or markers to the outside of the gift so the tag becomes interactive! Which snow globe will you choose first? So happy to have found you, and just in time! 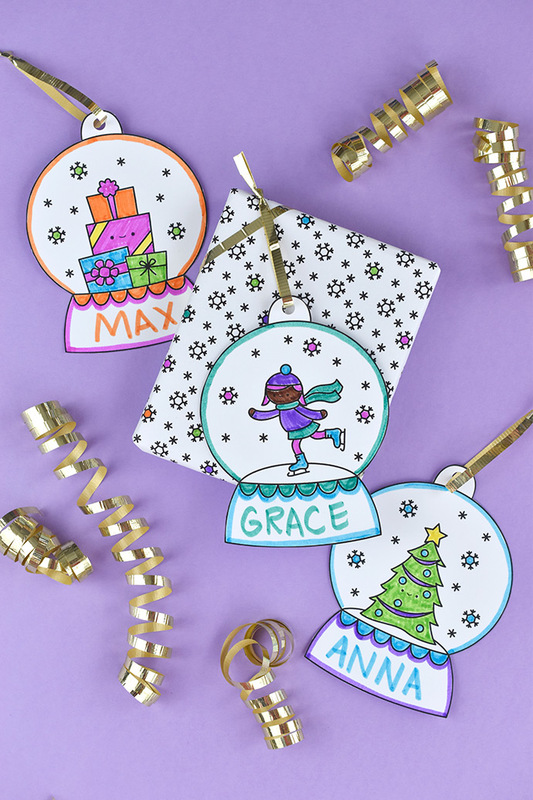 I love these tags, I love that the kids can color them in and they can become keepsakes each year. It is getting harder and harder to find images in black and white or that you do not need a machine for. I want the kids to learn how to craft from scratch, without gizmos or gadgets. These will definitely become a Christmas tradition. Thank you for sharing your talent. Blessings from Port Huron, Michigan, USA. Hey therethese are adorable! But PLEASEEEEE Handmade Charolette! PLEASE Visit & share the works of hattifant, via hattifant.com or search her “Christmas Madala Endless Card” & her self-titled channel on YouTube! 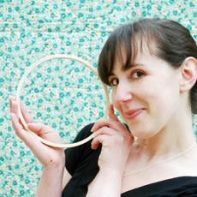 Her printables are artful some free, very unique, moving, & you WILL Abe totally amazed by her work! Amazing these are simple and adorable! Thank you, Merry Christmas and Happy holidays!